Here's a simple birthday card I made with my JustRite Birthday Wishes set. Do the colors look familiar? 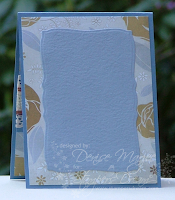 Yep, I stuck with the same colors from our last Stamper's Dream Dreamy Challenge. 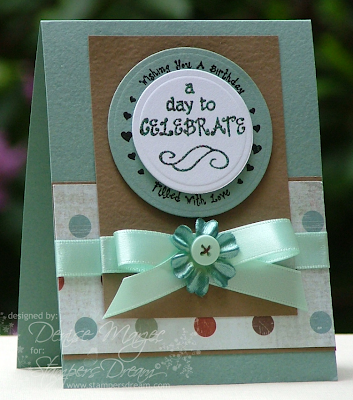 The JustRite Birthday Wishes set, Prism Island Mist and Suede Brown papers, French Flea Market DP, and Malachite embossing powder are all available at Stamper's Dream. The layout is Inkspirations Sketch #8. Both circles are up on foam tape. Today's challenge on the 2 Red Bananas Blog is to add ribbon to your project. I just got the Bow Easy and Sharon's gorgeous silk ribbon in the mail on Friday....perfect timing for this week's challenge! If you haven't seen Jerri's video tutorial on how to make bows with the Bow Easy, be sure to check it out. It's a GREAT tutorial and you can see how to make single-loop or double-loop bows. The image I used on my card is Jami's Flourish in Thought. I paper pieced her dress with my Wisteria DP and added some shimmer to her wings with my Spica pen. Both squares are up on foam tape. The card measures 4.75" square. See you a little later with a JustRite Birthday card. Hey all! Just wanted to let you know about the Spring Spectacular event at Taylored Expressions! Four limited edition Key Ingredients Kits are being offered at a discounted price of $12.95 . Happy Birthday wishes to Joy Kennedy! Hope you have an AWESOME day, gf! 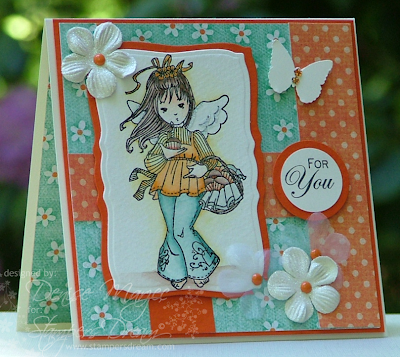 The cute image on my card is from a new exclusive OCL set being released at Eclectic Paperie today! It's called Hangin' Loose with Kona. Rumor has it Joy LOVES Kona...and I can TOTALLY see why. Oh my goodness, he's just the cutest thing! I think I love him too, Joy. Stop by Joy's Blog and send her some birthday love if you get a chance. Check out Cami's blog too for a whole list of people who made projects today for Joy with the Kona set. Hi all! I have two cards to show you today featuring the Doctor's Orders set from Taylored Expresssions. I paired it with my MME Grow DP and buttons/ribbon from the Father's Day Key Ingredients. The layout on the first card is from my Baker's Dozen teammate Jen Del Muro, this past Saturday's SFYTT. The white oval is up on foam tape. A second Cuppie was colored and popped up on foam tape too. The layout on the second card is from my Baker's Dozen teammate Karen Giron, her latest Sweet Sunday Sketch. A second Dr. Cuppie and Patient Cuppie were colored, cut out and popped up on foam tape over the main panel. The tissue boxes were also cut out and added to the card with foam tape. I glittered up the doctor's stethoscope with silver glitter...hee! Hi everyone and Happy Memorial Day to ya! My card today doesn't really have anything to do with Memorial Day, but it's a card I wanted to show you. The stamp was illustrated by my friend Jami Bova and you can get it at 2 Red Bananas. It's heat embossed in Ranger Gold Tinsel EP (has to be THE most sparkly EP I've ever worked with! ), watercolored with reinkers, and her wings were painted with Candle Light Shimmerz. 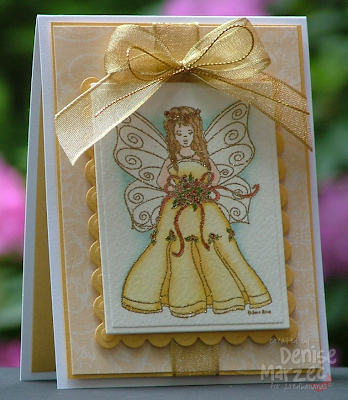 The Gold scalloped mat and mat behind the DP is Metallic/Mica Gold from the Paper Temptress. I'm tellin' ya...this is one sparkly and shimmery card! I hope you have a very safe and fun holiday! 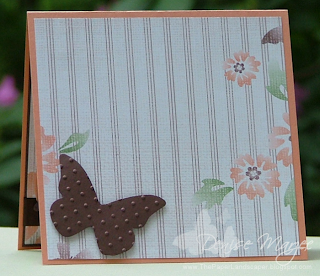 I have two cards to show you today, using Whiff of Joy stamps from Stamper's Dream. The first one is Confirmation Melinda...LOVE how this one is illustrated. Her face is SO sweet. Two images are layered together with the second one up on foam tape. The wings are all sparkled up with Diamond Stickles. The Twilight Light base was cut with my curved mega rectangles. The yellow DP is also up on foam tape. I colored her hair blonde for the Copic Creations Challenge. Here's the inside of the card. 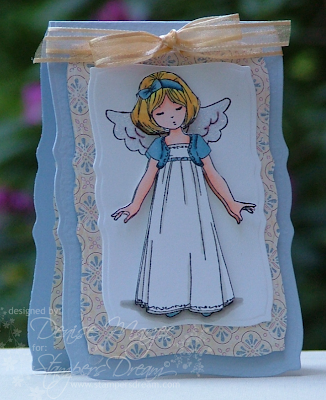 I added the Stampendous Angel sentiment to the top flap and then a blank white sheet on the bottom for writing. On the next card, I used my Willow Kneeling Up image. Again, two images were colored and the second one is popped up on foam tape. The Twilight Light panel behind the main image was run through the Cuttlebug with my Butterfly Impressabilities template and it's up on foam tape. ....and I'm out riding around on it!! Weeeee!!!!! Check out my new car....a Dodge Charger!! Ohhhh, I've wanted one of these for a long time. 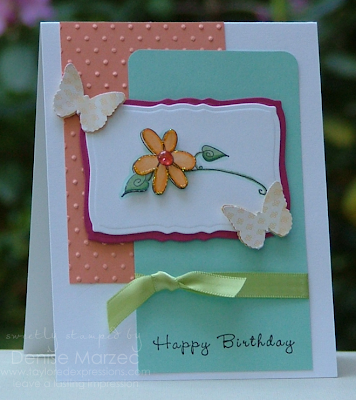 Here's a card for the SCS (SC229) Sketch this week using colors from Lauren's (MTTC02) My Time To Color Challenge. The punched butterflies and pomegranate mat behind the main image are up on foam tape. The main image is a stamp from my TE Fresh Flowers set. The flower was stamped twice, colored, and layered together with foam tape. Yellow stickles were added to the outsides of the petals and a rose-colored dew drop was glued to the center of the flower. Hope you're enjoying your Saturday! Here's a second card with Melinda, this time the layout is Whiff of Joy Sketch #31. Hi everyone! 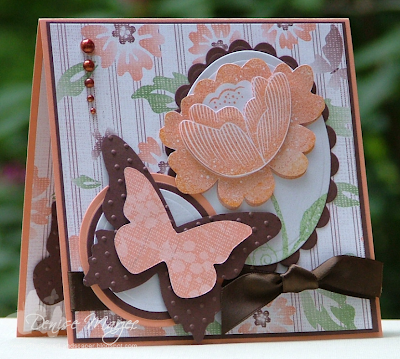 This month's Stamper's Dream Challenge is a color challenge with bling and texture. The colors are Blush Red Dark, Island Mist Medium and Birchtone Light with Suede Brown Dark or Ivory accents. If you don't have the Prism papers, the SU colors are Riding Hood Red, Baja Breeze, and Sahara Sand....or you can use colors that are close. When uploading to SCS, use keyword SDDC7 and be sure to link your project to Michelle's blog post because she has an AWESOME dreamy treat that you can enter to WIN!...see it over there to the right?....seriously awesome, right?!! My card is a 5" square card. The birchtone light panel was run through the Cuttlebug with my Paisley Impressabilities. 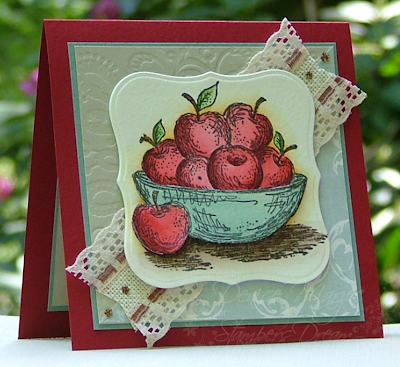 Tosha stamped this pretty Apples image for me (Artful Stamper)...thanks Tosha! The main image on the Labels One nestie is up on foam tape. A second bowl and apple was colored, cut out, and popped up on foam tape as well. I colored four of my floral mini rhinestones that Michelle sent me (thanks Michelle!!) with an E57 Copic marker and then added them to the ribbon and paper with a small dot of Diamond Glaze. 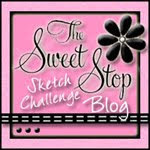 The layout is Karen Giron's Sweet Sunday sketch, the pretty lace ribbon is from my friend Janice (thanks Janice!). Be sure to check out what the rest of the Stamper's Dream Team has for you today: Michelle, Cammie, Charmaine, Kimberly, Laurie, and Tosha. Have fun with the challenge and good luck in winning the dreamy treat! Also, the Mondays in May Sale that began this week is the TE Favor Box Sampler. Check out all the details HERE on Taylor's Blog. The theme for this month's Dirty Dozen / Dirty Dozen Alumni Challenge, hosted by the awesome Christine Okken, is H2O. Restricted Element: Because of the *2* in H2O, we're to use only two embellishments. Shapes like nesties or sizzix die cuts aren't counted as an embellishment...whewie! Whoo-hooooo.....water-themed cards?! Sounds totally fun to me! 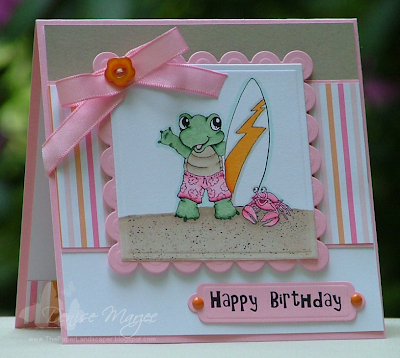 I love beach-themed cards and it gave me an excuse to use my Coastal Wishes set again that I got from Our Craft Lounge. 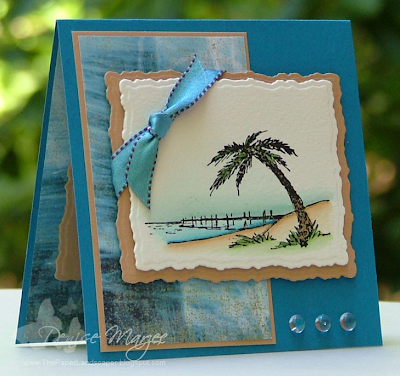 I also used dew drops and papers that sounded beachy and tropical....pacific point and tropical waterfall DP. Now, real quick...I know what you might be thinking....my card is SOOOOO much like this card that I made for the OCL sneak peeks a few weeks back. It wasn't intentional, I swear! I didn't realize how similar the cards were until the card was finished and I went to take a picture of this one. Oye! Brain fart? (Go ahead...you can have a good ole' laugh at me...I did!) Oh well, since I followed the rules of the challenge and the card is done, I'm gonna just *go with it*, LOL! All OCL sets are now on sale at Stamper's Dream for 25% off. Click here to check it out. Hey all! 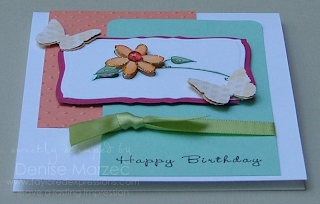 Here's a card for today's Timeless Tuesday challenge, which is being hosted by my friend Silke! Great challenge, girl, I love square cards too! 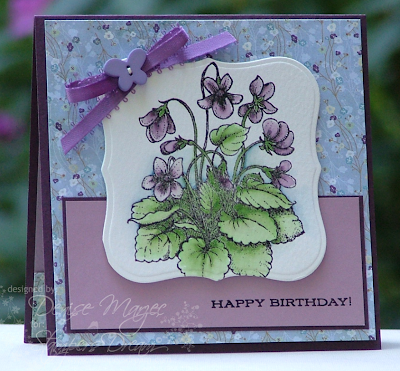 I also love this Sweet Violets set and my Wisteria DP so that's what I went with today. The main image is stamped on watercolor paper in craft black ink and then heat embossed with clear EP. The sentiment is heat embossed with clear EP too. The labels one nestie is up on foam tape. The Prism Papers, Wisteria DP, and Flourishes stamps are available at Stamper's Dream. Product links are in the supply list below. Today I'm the featured designer in the Taylored Expressions Newsletter. If you aren't signed up for the newsletter, you can do that from the homepage. It's free and you'll be the first to hear about the latest TE news and happenings. For my project, I'm showing you this Love Monologue from the Alterables Section of the Taylored Expressions store. It also features some of Taylor's yummy satin ribbon (willow and ivory), adhesive pearls, a Spellbinders die, and stamps from JustRite and Taylored Expressions. I love the size of this wooden piece. 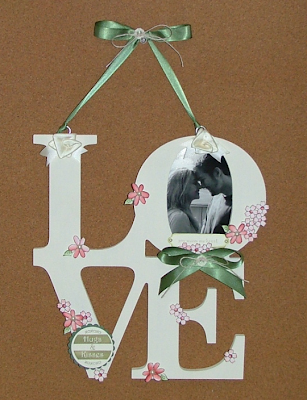 It measures 11" x 10.5" x 0.5"...a great size for a wall-hanging so I decided to make something for my daughter with a picture of her and her boyfriend. I used a sanding block to lightly sand the edges. It didn't need a whole lot of sanding, just a tiny bit. Then I painted it with FolkArt 515 Vintage White acrylic paint. Next, I stamped all the flowers from the Fresh Flowers set on watercolor paper, heat embossed them with clear embossing powder, watercolored them with reinkers, and cut them out. Some are glued directly onto the wood with Ad-Tech adhesive, others are glued down with Dimensionals. The pearls in the centers of some of the flowers were colored with a Y11 Copic marker. The ivory satin ribbons were made into ribbon roses following Christine Okken's tutorial that you can see HERE. They're really easy and fun to make! The sentiment, from A Year of Sweet Sentiments, under the picture was cut with my Spellbinders Double Ended Tag die and sponged with Always Artichoke ink. The sentiment is stamped with Spanish Olive VersaMagic ink and then heat set. The vanilla hardware in the center of the willow satin ribbons is SU's vanilla hodgepodge hardware. The tails of the large willow bow at the top is tied onto the Love Monologue with mini eye hooks that I picked up at WalMart. The JustRite Hugs & Kisses sentiment was stamped with Spanish Olive VersaMagic ink onto Very Vanilla CS and then heat set. That vanilla circle is up on Dimensionals. It's matted with Prism Sage Medium, which is also up on Dimensionals. Whoo-hooooo, Joan Ervin is today's Featured Stamper on SCS! CONGRATULATIONS, my *orange buddy*!! 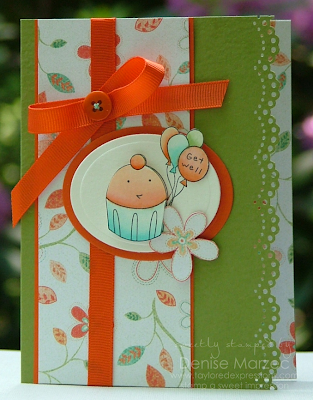 So anyway, when I saw that she was today's featured stamper, of course I had to make an ORANGE card for her! I chose to CASE this card of Joan's. I kept the flower and butterfly theme and the same layout. I just used different colors, papers, stamps, and made it a 5" square card. 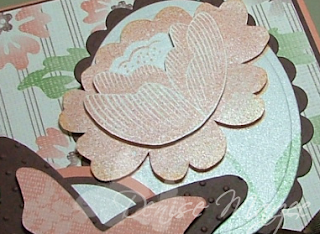 The bella blossom is three layers and it's stamped on Crystal Metallic paper from the Paper Temptress. The petals are layered together with Dimensionals. The butterflies are also on Dimensionals. The pearls were colored with an E27 Copic marker. Here's the inside of the card. The embossed butterfly is also on Dimensionals. Hope you all have an awesome day! Mz. Joan...my orange buddy....have TONS of fun checking out all the CASE'ing today!